Sterling silver rings with attitude! OK, usually we talk about one-of-a-kind custom jewelry we’ve created for an individual. Today, we’re going to talk about customizable pieces that we’ve created, available in both our Akron and Columbus Ohio stores everyday! They’re called E Motion Rings. 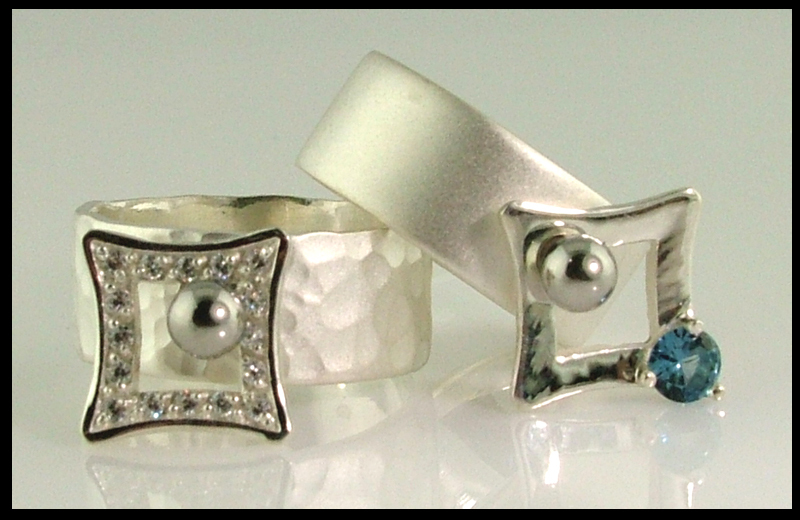 Sterling silver rings that feature a moving, changeable top. These beauties come in four different finishes for the base. High polish, sandblasted, hammered, or hammered and sandblasted. The tops screw on and are available with a border of white cubic zirconium, or with just a single, colored, cubic zirconium. We even have a bold, solid color, painted square top in all kinds of colors. And the best part – they start at only $69 for the base, and $69 for the top!